170 years on and one of the world's most enduring maritime mysteries is still unsolved. In 1845, Sir John Franklin's expedition left England for the remote Canadian Arctic amid much optimism. Their goal was to find the Northwest Passage, but it would become the greatest disaster in British arctic exploration. Franklin, his entire crew of 128 men and two ships, HMS Erebus and HMS Terror, disappeared into the vast wilderness of Canada's Arctic, while searching for a way through the fabled waterway. This year, during the northern Summer, One Ocean Expeditions has been invited by the Canadian Government to join a new search for Franklin's ships. "Our Government has made the North a priority. The 2014 search for the Franklin ships not only provides the greatest opportunity yet for finding the historic Franklin vessels, it will contribute significantly to our Government's Northern Strategy. Information gathered on this expedition will provide benefits to Canadians in the areas of Arctic sovereignty, marine safety, environmental protection, science and technology, history and culture." The 2014 Victoria Strait Expedition is the most ambitious to date, with more partners and more sophisticated technologies than ever before. The use of multiple platforms has the potential to significantly increase the amount of Arctic seabed mapped this summer. Ice and weather conditions permitting, the expedition could exceed significantly the amount of ocean floor scanned and mapped during any previous attempt. "Various government departments, including Parks Canada and the Royal Canadian Geographic Society have been searching for the remains of the Franklin ships for the last seven years. This year, One Ocean Expeditions offered the use of one of its ships to work alongside three other research vessels. She is perfect for this type of research work and was designed for exactly this kind of mission. Her high ice classification allows her to work in areas the other ships cannot". 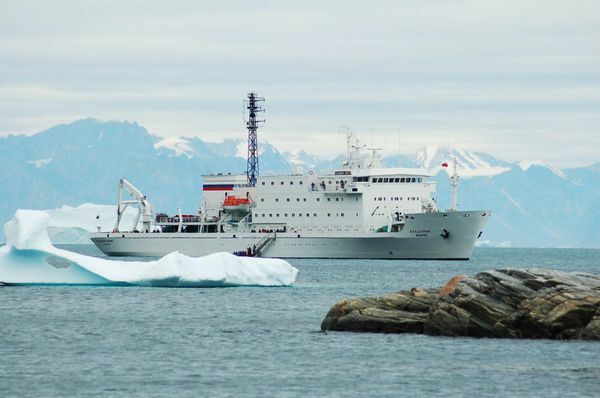 The Akademik Sergey Vavilov, currently operating in Spitsbergen, will re-position into the Canadian Arctic after completing the cruise season. One Ocean Expeditions' Akademik Sergey Vavilov will work alongside vessels from the Canadian Coast Guard, the Royal Canadian Navy and the Arctic Research Foundation. A number of additional smaller vessels, along with autonomous and remote-controlled underwater vehicles, will be utilized. Together, these platforms, vessels and vehicles will enable the teams to deploy high-resolution multi-beam sonar and side-scan sonar in a carefully choreographed effort to survey and map the seabed while searching for evidence of Franklin's lost ships. Limited berths are available to interested clients with the cost of participation being passed to the Royal Canadian Geographic Society as a donation. Travellers interested in the history of exploration of the Canadian Arctic can travel through these very waters in 2015, with One Ocean Expeditions. The operator has just released its 2015 Canadian Arctic schedule including a 12-night voyage through the fabled Northwest Passage.